Achieve a new level of productivity and throughput at the checkout stand with the Motorola's DS9808SR Bar Code Reader. The groundbreaking DS9808SR Bar Code Reader is designed inside and outside to bring a new level of versatility,functionality and performance to the checkout stand. 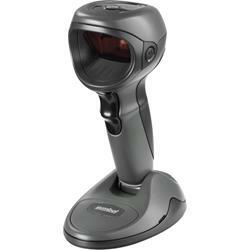 Outside, the DS9808SR Bar Code Reader offers an extraordinary one-of-a-kind hybrid form factor by marrying a solid base with our advanced handheld ergonomics, creating a scanner that is truly designed to deliver superior comfort and ease of use in both handheld and hands-free scanning modes.